In his sixth year as Newark mayor, Cory Booker was by now supposed to be getting ready to run for senator or governor. Instead, he says he could see himself seeking a third term. 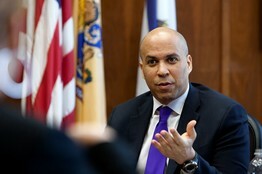 Newark Mayor Cory Booker, in his City Hall office on Wednesday, is considering a third term. Mr. Booker’s political fortunes have changed dramatically since his landslide victory in 2006. He is still a national star in the Democratic Party and a valued surrogate for President Barack Obama, but his path to higher office—which once seemed an inevitability—is now unclear: Sen. Frank Lautenberg has given no signs he is retiring in 2014 and ally Gov. Chris Christie also says he’ll run again in 2013. The more immediate question for the 42-year-old Democrat is whether Newark wants him. Mr. Booker has helped to transform Newark’s image from corrupt and violent to gritty and cool, attracting millions of dollars in investment from philanthropists and business leaders such as Facebook’s Mark Zuckerberg and Oprah Winfrey. But he has struggled taming the city’s unwieldy gears of government, and some of the city’s political establishment views him as an ambitious Ivy League outsider using Newark only to further his political career.